As with everything in nature, there are always predators and always diseases just as there are always those that are more susceptible. Even the hardiest trees and plants can become target to diseases and sometimes can result in devastating losses. In the case of Knockout Roses and other rose bushes, in the last 10 years they have been over planted in landscape areas and now have become a susceptible host. The infective agent known as the Eriophyid Mite is responsible for Rose Rosette Disease (RRD). Rose Rosette Disease is a viral disease that is transmitted by Eriophyid Mites. Most rose species are susceptible to Rose Rosette Disease and will often die within a few years after becoming infected. Rose Rosette Disease can be tricky to diagnose because the symptoms often resemble that of herbicide (weed control) injury due to the shriveling, curling, and color change of the leaves and petals. Other symptoms of this disease include thickened stems, rapid stem growth or shoots, and excessive amounts of thorns that are usually soft and red or green in color. Another major symptom to watch for is the clustering of small branches, this will often resemble a witches’ broom. The Eriophyid Mite is the culprit responsible for transmitting Rose Rosette Disease. These arachnids belong to the spider mite family, but are 3-4 times smaller than the average spider mite and invisible to the naked eye. They can be found on new growth, buds, and between stems when using a 20x or greater magnification hand lens. These microscopic Eriophyid Mites are transferred from one area to another by wind and often do little to no damage by feeding on the plant, the damage is done through the viral infection that they transmit while feeding. The transmission of the disease usually occurs between May and July, with symptoms starting to appear shortly afterwards. The first report of the Rose Rosette Disease was in the 1940’s; since then, little progress had been made until 2011 when new research indicated that a virus is the cause of Rose Rosette Disease. 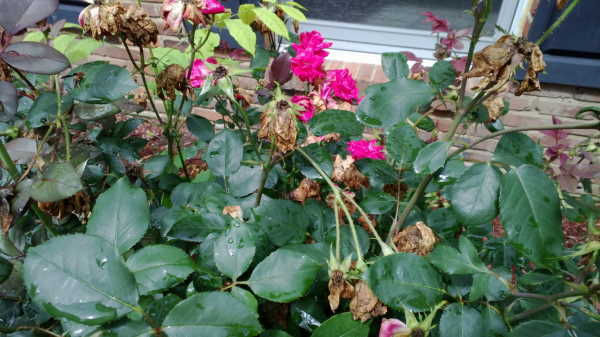 Unfortunately, there is no known product that can control or prevent the disease from infecting your roses, including systemic insecticides and premium miticide applications. The best cultural practice for these mites would be to prune frequently any stems that appear to have the symptoms and properly discard clippings. In addition, all pruning equipment should be washed with a bleach solution before using again to prevent transferring the mite to another host. The overall best way to control the mites from spreading Rose Rosette Disease is to remove the rose plant all together, including all of the roots, as pruning will only slow the disease and unfortunately will not stop it. Although it seems as if the Rose Rosette Disease may be inevitable, knowing about its existence and about its symptoms could help prevent it from spreading. Hopefully as time and research continue, a curative application will be available in the future, until then keep an eye on your roses and trim or remove them as necessary.